Although we refer to "Pets", to most guests this will of course mean a dog. Many guests have brought their dog along and have had a lovely time - it's great countryside for dogs! Subject to the conditions below, one normal pet dog will usually be accepted without deliberation. We will consider two small or medium sized dogs but we regret that we do not accept bookings for more than two. Our acceptance of dogs is also dependent on guest numbers and the makeup of the party. We do not usually charge an additional damage deposit if we agree to a single pet dog but we reserve the right to do so at our sole discretion. In making the booking and thus accepting our Terms & Conditions and this Annex you agree to be liable for all the costs of rectifying all issues arising from your pet's stay whether damage, soiling, fouling, infestation or any other matter. Where it is appropriate the following text applies to the general Terms & Conditions (A.1 - A.9 are applicable to all pets. A.10 is applicable only to the situation specified). A.1 Well behaved pets are welcome with our explicit permission and subject to adherence to the conditions below. We reserve the right to accept or decline bookings according to breed, size, numbers or any other factor we deem relevant. Once a booking which includes a pet or pets has been accepted no additional pets may be added to the booking but a substitution may be accepted subject to circumstances and our agreement. A.2 Pets must not be left alone in the house and are not allowed upstairs. They are not allowed directly on furniture, seating, beds or rugs and you must provide your own suitable and clean protection to prevent them from coming into direct contact with our furnishings. You must bring with you everything your pet needs to enjoy a comfortable visit; bed, bedding, basket/cage, dishes, towels, grooming items, etc. You must not use anything we have provided in the property, which is supplied exclusively for human use. A.4 Pets must be treated for fleas, tics and worms ahead of the visit and if appropriate they must be certified free of rabies (there is no rabies here though). This will have been done to comply with Pet Passport regulations if you are coming directly from the UK or Ireland but if you have been in France for an extended period or are arriving from a country where such documentation is not required you must comply with the requirements and timings of the UK Pet Passport scheme. We reserve the right to inspect documentation or see proof of treatment where there is any doubt. A.5 Pets must be kept under control at all times and not allowed into areas containing farm animals or crops. Pets must be actively prevented from getting within five metres of the pool area. The pool and surrounding area are for human use only and in the event of evidence that pets have been in the pool you will forfeit your security deposit as it will have to be drained, sterilised and refilled. Any fouling in the house or grounds of the property must be immediately "bagged" by you and disposed of in an official household waste disposal receptacle at the earliest opportunity (please double-bag it). The material must not be stored in the house or allowed to build up and must not be disposed of within the environs of the property. The material or bags must not be flushed down toilets. The enclosed patio area is planted with herbs intended for human consumption. Dogs must be actively prevented from using this area for toilet, including just "lifting a leg". Likewise in respect of any area containing edible plants, e.g. strawberries. All damage or soiling caused by pets must be notified to us as soon as possible (so we can rectify the situation prior to the arrival of subsequent guests) and, if appropriate, paid for before departure. This applies only to pets that have not been previously agreed by us and named on your Booking Confirmation & Invoice. If we have not agreed any pets, or the breeds or numbers are not as agreed we reserve the right to require that either the pet(s) is/are placed in kennels in France, by you, for the duration of your stay and at your expense or you vacate the property without refund or compensation. Unapproved pets (whether your own or those of your own visitors) must not be allowed in the house and at our sole discretion we may require that unapproved pets are kept securely in a barn until the matter is resolved. If you bring a pet that we have not agreed you should start from the premise that you will be refused entry to the property and, even if subsequently agreed, you will pay a surcharge of £200 and an additional Security Deposit of £200. Before booking with your dog(s), you should have regard to the layout and the décor of the house. That we are happy to accept well behaved pets does not mean it is especially dog-proof. La Goupillère is a very nice but otherwise normal home, not a hunting lodge! Little paw prints on the tiled floors downstairs can be wiped away but sullying of the white walls cannot. We trust that potential guests will take their pets' propensities into account when assessing the suitability of La Goupillère and if it is deemed suitable will, if necessary, take measures to prevent mishaps. France has strict laws about some breeds of dog, placing them into one of two categories, "category 1, Attack Dogs" or "category 2, Guard Dogs". Whether or not they are pedigree can also affect the situation. You cannot bring category 1 dogs into the country but you may, according to their specific circumstances, bring category 2 dogs subject to conditions such as muzzling and/or them being on a lead in public places. You need to research the current situation yourself but a good place to start is here. We will not accept breeds in either category or those that are known to present a potential threat to other animals. Upon your request, we can provide a proprietary pet gate between the lounge and downstairs hallway or the kitchen. Should you wish to use this, it is not guaranteed foolproof and its failure to contain your pet(s) will not be accepted as a fault on our part. It is your judgement alone as to whether it is suitable. If you opt to use this gate please be aware there is a bar across the bottom at floor level. It is in the nature of the design and is an unavoidable potential trip hazard. The wooden gate at the top of the stairs is intended only to check small children from accidentally stumbling down the stairs. Pets are not allowed upstairs and this gate is not to be used to contain them there. It may of course be used to ultimately prevent them from going upstairs but should not be the first line of prevention. Neither gate will prevent a deliberate attempt to circumvent them or support weights or pressures beyond their design limitations. Your pet will need to be chipped by your vet. Your pet will need to have a rabies vaccination. Your vet will need to complete a pet passport, documenting your pet’s chip number and stamping the correct page to show the rabies vaccination has been given and its expiry date. Keep this passport safe and take it with you when you and your pet travel. You must wait 21 days before travelling. No less than 1 day but no more than 5 days before your scheduled return, you must visit a vet to have your pet treated for worms. The vet MUST stamp the relevant page to show that treatment has been given (with date and time). We recommend you to double check the vet’s entry in the passport before you leave the surgery. If this treatment isn’t given or the treatment has been given outside of the 1 to 5 day window, your pet will not be able to re-enter the UK. Please note the above applies for direct trips between the UK and other EU countries only (plus some others considered to have a "robust veterinary system" e.g. Australia and the USA). Very different rules apply to countries not covered by this regime. Click here https://www.gov.uk/take-pet-abroad for full details. The rules may change so please satisfy yourself of the latest situation before booking as we cannot be held responsible for the consequences of erroneous information. 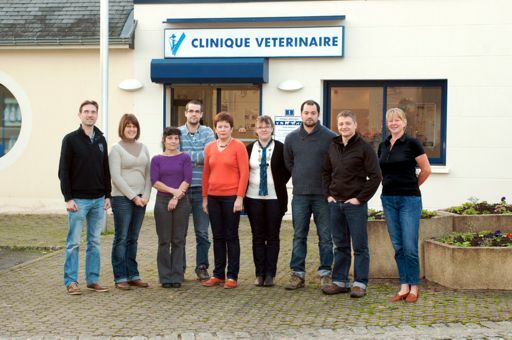 We will be pleased to arrange an appointment for you with the local vet in Villaines-la-Juhel or you may of course do so yourselves. However, although it is a large practice it is primarily agricultural and there is not necessarily a vet in attendance all the time, so please leave yourselves ample time.